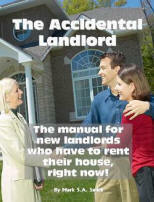 The New Landlord Manual: Especially for new landlords who need to rent their house today. and you can do all this in a weekend. It was 1982. I bought my first house straight out of college. Money was easy; you only needed a small down payment. Two years later, I was assigned by my employer to an over-seas location, and I became, by accident, a landlord. Because of the economy in the 1980’s, I had a house that was worth LESS than the mortgage. I was forced to be a landlord until the market turned around. Sound familiar? I'll share with you what I learned in the last bad economic cycle. You benefit from my experience and mistakes. Because I wasn't in town, I had to get a property manager to rent the house, look after the place, and manage tenants. They did the best they could, but the rental house stayed vacant about 20 percent of the time. So, many months I had to pay the mortgage out of my pocket, and repairs from careless tenants were eating me up. I was frustrated. I had to create a fool-proof system that let me quickly rent the house to people who would pay their rent, on time. I had to select renters that wouldn’t trash the place, wouldn’t call me in the middle of the night with emergencies, or complain every time a faucet leaked. And I figured out how to do it. Someone said, “Hey, why don’t you make this available to others? Why don’t you write a book?” Even veteran landlords found the information interesting, exciting, and they used the ideas to get higher rents. After years of testing and refinement of the Accidental Landlord system, you can benefit from my experience, pain, and hassle. You get to tap into my 23 years of being a part-time landlord. Why Do You Need to Rent Your House? Maybe you've just bought an investment property and want to manage it yourself. This manual will show you how to get the house rented fast to people who won't trash it. Maybe you can't sell your house, but you've got to move. You're an accidental landlord, and this manual will help give you peace of mind because you'll know exactly what to do and how to do it. Maybe you're ready to downsize, but want to keep your house for cash flow. This manual will let you discover how to create the most cash flow from your home and not have your renters calling you all the time, driving you crazy. No matter why you want to rent your house, this manual can help. Even if you're a seasoned landlord, I'll bet that you'll discover tips and tricks that you don't yet know that can help reduce your headaches and help you collect higher rents. This is the most advanced do-it-yourself home rental kit on the market. But it is also one of the simplest systems I've found. I designed this system from scratch to let people who needed to rent their home do so painlessly and easily. It assumes that you know nothing about renting your house, it's specifically for new landlords. It will save you money, save you time, and eliminate all the headaches possible. What Would You Do with an Extra $50 to $200 a Month, or More? You will learn what to say and do to get rents that are at least 10 percent higher then other houses in your neighborhood! (I show you how on page 28.) What's that worth to you each month? $50, $100, $200 more in rent? Think about it this way, in the first month, you can make back two to ten times what you invest in this manual! I guarantee it, or your money back! Click to Securely Buy Now! You'll also know how to make doing background checks a breeze. I tell you exactly what to say when you call references. You get a complete step-by-step system that makes it easy for you to find headache-free renters who will pay the rent on time and let you live in peace. What's that worth to you? Is it worth the price of a nice lunch for two? "...A Personal Guide By My Side..."
I just purchase the New Accidental Landlord Material after having just purchased my first rental home. I also went to the library and probably brought home at least 15 good rental books...yes AT least 15... but the one I keep coming back to is the "Accidental Landlord"! I feel like it has given me all the tools to use (without reinventing the wheel thru my own trial and error) to successfully succeed with confidence in preparing and renting my first purchased Rental Property. It's actually done in such a way where it's a short enough read and I feel like I have my own Personal Guide by my side assisting me every step of the way with proven fail proof steps so I'm more likely to succeed from the get go! For Rent Sign: You get a template for a proven for-rent sign. Just update the number of bedrooms and the phone number, and it's ready to print and post on your property. Application for Rental: This form gathers the most information you need so that you can choose the best, most headache-free renter. A Magic Lease: This is the lease I've used for 23 years. And it keeps me from getting calls in the middle of the night, makes sure that I get paid at the first of every month, and eliminates headache renters. Condition Report: You need this to prove any damage to your house. Without this, you won't be able to claim the damage deposit. Move Out Check List: Most landlords deliver this when a renter moves out. I suggest that you give it to your renter when then move in so they know what to expect when they need to move on. Repair Order: This makes the paperwork simple when you have to make repairs. Sample “Raise the Rent” Letter: Hey, if they stay beyond a year, you'll want to increase the rent. Here's how. Sample “Move Out” Letter: When it's time for them to go, here's what you need to tell them. Sample “Send Money Now” Letter: I've only had to send a letter like this three times in 23 years. And they were sent to people who I didn't screen properly. I'll show you how to avoid people like that. Lead disclosure: You also get the federally required forms and pamphlets you must give to your renters if your house was built before 1978. The lease includes HUD approved disclosure language. Stay clear of the law: You get free access to a Website that provides specific information about landlord-tenant laws in your state! “I have been in the investment apartment business for over 20 years and this book is the best resource I have read for straightforward steps to take in renting and preserving your investment along with peace of mind as a landlord. Just look at what you learn: This is the table of contents from the Accidental Landlord, complete with page numbers. You can use this as a checklist of things you need to do to rent your house. And you get results, guaranteed! If you don't make more rent from the ideas in this book, I'll give you your money back. And you keep the book and the bonuses. or I'll give you your money back. If you're not 100 percent happy, just send me an email, and I'll refund your money, no questions asked. You get all of this for just $37.00! from people who have used the system. The price for this manual will go up to $97.00 when the market test ends. So, order today, with complete confidence that your satisfaction is guaranteed. How you'll get the Accidental Landlord. Buy now, and you'll immediately be able to download this eBook and all the forms to your computer. The Accidental Landlord manual is in Adobe PDF format. Download the free Adobe reader for your computer from Adobe.com. You receive a license to print and use this book and these forms for your personal use. YES! I want to make more rent and have fewer headaches. with a one year unconditional money-back guarantee. $37.00 before your raise the price! with our Secure Order Form! If you're ready to become a successful landlord, click now and get your copy. You have everything to gain and nothing to lose, except headaches and bad tenants. You'll make more money right away! And I guarantee it! P.S.- Review the Accidental Landlord with confidence with my 100% risk-free money back satisfaction guarantee. And you have one full year to read, review, and decide. Order now before we end the market test at the low price of $37.00! Sign up for our FREE New Landlord Mini Course. In seven days, you'll learn the most important aspects of being a successful, and profitable landlord! You can opt out anytime you want and we protect your privacy. You've got nothing to lose, and everything to gain! Sign up now.